A selection of teachings presented during the transmission of The Rinchen Terdzö - ‘The Precious Treasure Teachings’ of Jamgon Kongtrul Lodrö Thaye the Great, held at Palpung Sherab Ling Monastic Seat, India, in 2006. The Buddha, the Dharma, and the Supreme Assembly. Contents: Chanting the Mantra of Noble Chenrezig - The Essence of Samaya - Mandala - The Basics of the Ground Floor - Our Next Life - Forceful Deities - “The Center of Space” - The Ground, Path, and Fruition - The Karma of My Homeland - The Karma of My Homeland: A Lesson? - The Four Immeasurables - Dharma Practice - A Request - Dedication and Long Life Prayers. I want to speak about chanting the mantra of Noble Chenrezig. We repeat his mantra, OM MANI PEMA HUNG, four times in a melody that we sing four times. The first time we chant his mantra, we are making prostrations and paying homage to all Buddhas, to all Bodhisattvas, and to Chenrezig. One melody is complete when we chanted his mantra four times. The second time we sing his mantra four times, we are offering our merit, our wisdom, everything to all Buddhas, to all Bodhisattvas, and to Chenrezig. The third time we chant his mantra four times, we are receiving the empowerment, the blessings of the body, speech, and mind of all Buddhas, Bodhisattvas, and Chenrezig. The fourth time we sing his mantra four times, we are dedicating the merit, the blessings we received, and everything for the enlightenment of all sentient beings. Just chanting Chenrezig’s mantra four times by singing the melody four times is a very easy way to practice Vajrayana, Mahayana, and Hinayana together. Why is it necessary and beneficial to chant Noble Chenrezig’s mantra? We are in samsara because of our ignorance and because our ego is huge. Our attachment, aggression, jealousy, and miserliness are very big because of our ignorance. We are slaves of our defilements on so many occasions and so many times. We get lost and sometimes we find. Each one of us can say this of themselves from time to time, because sometimes we get lost and sometimes we find ourselves. As practitioners of Chenrezig, we find ourselves by singing his mantra. Where did and do we get lost again and again? 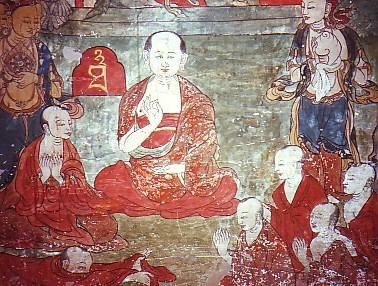 In samsara. What makes us get lost in samsara? Our ignorance. In which way do making prostrations and paying homage, making offerings, receiving the transmission blessings, and dedication help us overcome suffering that samsara inevitably entails? Chanting Chenrezig’s mantra is very simple; it goes to the root cause of the suffering that marks samsara. The root cause of suffering is ignorance. The more ignorance we have, the more egotistic, aggressive, greedy, etc. we will be. Therefore, we first bow to Chenrezig, in that way transforming our ego into devotion. Making prostrations with our body transforms our arrogance and pride and thus we become humble. Once this very profound transformation of our body has occurred, we engage in the second practice, which is making offerings. Making offerings doesn’t mean giving our money away. It’s ironic that we don’t want to give something we own and consider precious away, while we don't mind giving the merit and wisdom that we accumulated over countless lifetimes. This is due to the blessing of the accumulation of merit and wisdom. Why, then, can't we part with some little thing that we think is precious? Because it is glue that keeps us stuck in samsara. Our defilements make it extremely hard for us to part from any small thing that we own. So, we let things that we own be and don't bother about them. These things aren’t worth the energy we waste on them. We can offer, without problems, the merit and wisdom we accumulated for countless lifetimes to all the Buddhas and Bodhisattvas. Our merit and wisdom are billions and trillions of times more valuable than anything else we could offer, so we offer that. After having offered all our merit and wisdom, we need to receive the transmission blessings. Our body, our speech, and our mind are the potential of Dharmakaya, Sambhogakaya, and Nirmanakaya. But at this time our potential doesn’t manifest as the three kayas, ‘bodies of a Buddha.’ Why? Because up to now our potential hasn’t matured, hasn’t been cleansed through purification, hasn’t been transformed through practice. I can’t speak for others. I’m very pragmatic and don't believe in hocus-pocus that easily. I don't see any Buddhas here. It’s my problem, but I definitely know what I am. Because my body is not Nirmanakaya, I don't even have one of the 32 major and 80 minor marks of the Nirmanakaya (‘a Buddha’s physical manifestation that can be perceived by ordinary beings ’). And I can’t have one of them unless I transform my body into a Nirmanakaya. For example, often my body becomes sick and I have a cold, a cough, and so forth. When I speak in Tibetan, participants of this event who only speak English don't understand me. When I alternate between speaking Tibetan and English, participants who only speak Hindi don’t understand me; the same for the Chinese participants who don’t understand Tibetan or English. I don't have the 60 qualities of a Buddha's speech, therefore it’s evident that my speech is not Sambhogakaya (‘the enjoyment body that is the luminous aspect of a Buddha ’). My mind is not yet Dharmakaya (‘the truth body of enlightened qualities’). For example, I have to be very careful when reading a scripture that consists of more than one text, otherwise things get mixed up. Not only that, since I’m not modern and don’t use a computer, I have to write things down that I need to remember, using paper and pen, otherwise I forget. So, my mind is not Dharmakaya. That’s why my body needs the blessing of the Buddha's Nirmanakaya, my speech needs the blessing of the Buddha's Sambhogakaya, and my mind needs the blessing of the Buddha's Dharmakaya. The blessings are like a wish-fulfilling tree. The seed is there and isn’t contaminated, but it has to be planted, watered, and provided with all conditions that make it grow and mature into a wish-fulfilling tree. That's the purpose of chanting Chenrezig’s mantra a third time, to receive the transmission blessings. The purpose of chanting OM MANI PEMA HUNG a fourth time is to let go of everything - our merit, the blessings, the transmissions that enabled us to work for the benefit of all sentient beings – and to just be what we always were and already are. On this occasion, I want to say that the word “pointing-out” in Tibetan means ‘introduction to the nature of the mind.’ English-speaking students come to me and ask me to do “pointing out.” I’m not a politically correct person, so I just say what I think. Using the word “pointing-out” in this context is totally out of a fantasy world. We are Buddhists. The Tibetan term for “Buddhist” is nang-ba. Nang means ‘inside, all solutions are inside.’ The potential of enlightenment is inside, not somewhere “out”-side. So, if you want to speak in a way that I agree with, you should say, “Can you give me the introduction to the nature of mind” or “pointing-in instructions”? You shouldn’t ask for “pointing-out instructions.” You know, pointing out is not Buddhist, because Buddhism isn’t something out there. This is my perception. Of course, I’m not a linguist and might be wrong. Maybe in English “pointing out” means ‘pointing in.’ It's possible. But I understand that pointing out is pointing out. I cannot hear that pointing out is pointing in. So, in this way, chanting OM MANI PEMA HUNG is pointing in, pointing inside. When our ego is transformed into devotion, it is the nature of our mind at this stage. We let go of holding on to this state by making the offering of our merit and wisdom that we accumulated during countless lifetimes to all Buddhas, all Bodhisattvas, and Chenrezig. Offering this way while chanting Chenrezig’s mantra a second time weakens our grasping and clinging. By receiving the blessings while chanting Chenrezig’s mantra a third time, our body, speech, and mind are blessed by the Dharmakaya, Sambhogakaya, and Nirmanakaya, which is the nature of our mind. At the end, we let go of the third state while chanting Chenrezig’s mantra a fourth time by dedicating the merit. Everything we then do is beneficial for all sentient beings, because that is the nature of our mind. There’s no such thing as “The nature of the mind is like this” or “The nature of the mind is like that.” There’s no limitation to the mind. At this level, we always apply mind’s nature and transform it further and further. It will improve if we do the practice of Noble Chenrezig one million times. It will improve slightly if we do this practice once. But there will be a large improvement if we do this practice one million times. If we do it one billion times, then it will be improved much more. That is why we repeat the practice and do it again and again. Some people ask me the very strange question, “Why do we repeat the practice?” I respond by saying, “Are you kidding?” They answer, “No.” Then I ask them, “Would you like to have one dollar or a million dollars?” They will definitely answer, “A million.” Isn't a million dollars a repetition of one dollar? In the same way, instead of just saying a prayer once, we say it a million times. Don't you think that one million prayers are better than one? So, it’s very important to repeat the practice, to repeat it many, many times, and to always keep it in mind. If we don't repeat it, we forget. For example, if I don’t repeat your name in my head, I will forget it. Anybody who tries to remember somebody's name repeats it in their head, right? Everyone repeats, in their head, the numbers of their passport and visa as well as the expiration date of their visa. If we only looked at those numbers once, we wouldn’t remember, and we might see that our visa expired 10 days ago when we finally check. Then we get into big trouble, can even land in jail. So, we repeat anything that is important for us - we look at it and repeat it again and again to make sure. This is why we have thousands of Buddhas and not only one Buddha. This is also why we don’t recite a prayer once, but 3 times, 10 times, 100 times, one million times, one billion times. All of you are taking many initiations, not only here during The Rinchen Terdzö but whenever and wherever there’s an opportunity, and that is wonderful. It’s very good. And it’s also very fortunate. We are all very fortunate. I have taken thousands of initiations, so I’m very fortunate. You’ve taken many initiations, so you’re very fortunate. But if we aren’t able to keep the samaya of an initiation, then it isn’t productive. It isn’t only not productive but is very counter-productive. Therefore, we have to keep the samaya of an initiation. But there are many levels of samaya. If we know all the details of samaya, it will be even worse not keeping and not holding them preciously. It would be like knowingly breaking samaya. Therefore it’s better to know the details and what the essence of samaya is. Samaya is a Sanskrit term. It was translated into Tibetan as dam-tshig and means ‘the sacred pledge, the commitment of Vajrayana.’ The essence of every samaya is very simple – it is realization of what we are. What are we? We are our body, we are our speech, and we are our mind. Everything else is superficial. But, everything we think we own and call “mine” is superficial. Even our name is superficial. Our name was given to us maybe three days after our birth, maybe two days after our birth; sometimes the name of a newly born baby is given one hour after birth. That is our name. This way, what we are is our body, speech, and mind. Actually, we don’t own the superficial aspect we think we are, the aspect we call “my body.” One day we have to leave our body, and then people will take it away and put it in a box. Depending on the culture, some people put makeup on the corpse, dress it up, and then put it in a box. Some people fold the corpse up and then put it in a box. Some people burn it. Some people bury it under the ground, otherwise it’s very unpleasant. From hour to hour the corpse looks worse, smells worse, and gets worse in many ways. So, we don’t really own our body. Looking deeply, we are the essence of our body, the essence of our speech, and the essence of our mind. The essence of our mind is Dharmakaya. The essence of our speech is Sambhogakaya. And the essence of our body is Nirmanakaya. That is what we are. Instead of apperceiving our body, speech, and mind the usual way we do, keeping and holding the tantric samaya means recognizing the three aspects of our being, Dharmakaya, Sambhogakaya, and Nirmanakaya, in a non-dualistic, uncontrived, unfabricated, spontaneous, and natural way. Clinging to the three true aspects of our being in a dualistic way is very bad. It is thinking, “I am Dharmakaya. I am Sambhogakaya. I am Nirmanakaya.” You know, this is another form of ego. We have to have the sacred outlook, the sacred “in-look,” because sacred is what we are. And we have to maintain it. There are many ways to do this. If we don’t have a Sadhana (the Sanskrit term for ‘liturgical text that we recite and practice’), one very easy way of maintaining a tantric samaya is practicing Noble Chenrezig by reciting his mantra, OM MANI PEMA HUNG. This way we can maintain and uphold awareness, mindfulness, and the sacred view of the essence of our body, speech, and mind as Dharmakaya, Sambhogakaya, and Nirmanakaya - not in an egotistic way, but in a very humble, in a very simple, non-dualistic way. We keep all tantric samayas, the billions of tantric samayas, when we do this. A tantric samaya is a most difficult commitment. There are 14 main ones, 25 secondary ones, and something like 700 commitments to keep in the third category of tantric samaya. Nevertheless, the tantric samaya practically comes down to a simple thought that we all have. We all have thoughts, therefore the commitment can be broken by means of a simple thought. If we are able to uphold the simple thought, then we will be able to maintain and keep the tantric samaya. I’m sure all of you practice the one or other Sadhana. If not, it’s quite serious, because then we just get up, fool around, gossip, engage in meaningless chatter, fall asleep, and get up again. Spending life in such a way, it will be just passing by, until death. Then the next life will be like that. Since this life is like this, the next life will also be like this. Therefore, one Sadhana that everybody has to have is The Sadhana of Noble Chenrezig, because it incorporates all Sadhanas. It’s very interesting. Many people come to see me and ask, “What is my yidam?” How am I supposed to know what their yidam is (yidam meaning ‘ tantric meditation deities representing different aspects of enlightenment ’)? But when people ask me, then I sincerely tell them, "I don't know what your yidam is, but you should practice Noble Chenrezig and repeat his mantra, OM MANI PEMA HUNG.” When they hear this and I look at their faces, I see that they are very unhappy with my answer. They feel insulted. They want to hear something like, “Your yidam is Hevaja. Your yidam is Vajravarahi. Your yidam is Kalachakra.” When I say, “Your yidam is Chenrezig,” then they think that it’s like an insult. Somehow they aren’t yet able to engage in a higher tantric practice, therefore they should simply repeat Chenrezig’s mantra, OM MANI PEMA HUNG. Actually, Noble Chenrezig is the father of all Buddhas and his mantra is the king of all mantras. All the past Buddhas wouldn’t have attained enlightenment without Chenrezig. All the present practitioners and Bodhisattvas will never attain enlightenment without Chenrezig. All future practitioners and Bodhisattvas will never attain enlightenment without Chenrezig. The vow of Chenrezig is: “I promise not to pass into the state of enlightenment until the last sentient being has attained perfect Buddhahood.” Why is this? It’s very simple. What is Chenrezig? He is the embodiment of compassion, Bodhicitta. How can anybody reach Buddhahood without Bodhicitta? It’s impossible to reach Buddhahood by mistake, accidentally, or by chance. We reach Buddhahood intentionally, and the intention is Bodhicitta. That is what Chenrezig, Avalokiteshvara in Sanskrit, represents. If you have The Chenrezig Sadhana, which is the most sacred and most profound Sadhana, then by engaging in the practice, you can attain, with awareness and in a very simple way, his body, speech, and mind, the Dharmakaya, the Sambhogakaya, and the Nirmanakaya. You might know this already. I’m sure you heard it hundreds of times. But you might not know this clearly, so I thought it would be good to tell it one more time. When we speak about samaya, this is the real definition of tantric samaya. Of course, if we go into extensive details, we would need to speak about the Guru, the deities, the protectors, and so forth. This was a presentation of the main points. Skandha is the Sanskrit term that was translated into Tibetan as phung-po and means ‘gathering, an aggregation of many parts.’ There are five skandhas that comprise the physical and mental constituents of a sentient being. They are: physical forms, sensations, identification, mental activities, and consciousnesses . We know that our mind-consciousness is polluted because of our ego, our ignorance, our attachment, our thoughts, and our other defilements and that the essence of all these defilements is emptiness and therefore is pure. The same with the skandhas and the eighteen elements of sensory and mental experience, called khams in Tibetan (‘materializing forces, patterns of behaviour, or character of an individual’). The eighteen khams (dhatu in Sanskrit) are: the six consciousnesses of eye, ear, nose, tongue, body, and the mind; the faculty of perception of these six; and the objects experienced by them (forms, sounds, smells, tastes, physical sensations, and mental phenomena). All skandhas and dhatus are the mind, and their essence is pure. The pure constituents of a sentient being are represented in a mandala by the male and female deities, Ye-shes-pa and Ye-shes-ma in Tibetan. Yeshepa are the male enlightened aspects of the Tathagatagarbha; Yeshema are the female enlightened aspects of the Tathagatagarbha. Tathagatagarbha is the Sanskrit term that means ‘the essence of enlightenment.’ It is always and ever present in all sentient beings. It is the Buddha nature, de-shegs-snying-po in Tibetan. The pure male and female Bodhisattvas are called Sems-pa and Sems-ma in Tibetan. For example, Noble Chenrezig (Lord of compassion) and Noble Manjushri (Lord of the perfection of wisdom-awareness) are male Bodhisattvas. Arya Tara (the female Bodhisattva of compassion) and Arya Sarasvati (Patron of arts and sciences) are female Bodhisattvas. Furthermore, there are male and female forceful deities. Usually referred to as “wrathful,” they are the activities of the power of wisdom that vanquishes conflicting emotions and defilements. We engage in negative activities by means of the force of our negative power. When transformed, we have positive power with which we engage in positive actions. The forceful deities are the enlightened manifestation of this positive power. All mandalas have the three types of deities and their retinue, the Yeshepa and Yeshema, the Sempa and Semma, the forceful deities, as well as the gatekeepers of the mandala. The Sanskrit terms for male and female deities are deva and devi. The Tibetan terms for deva and devi are lha and lha-mo. Although they manifest in a variety of ways, the three types of Lha and Lhamo in the mandala are all one. They are what we really are. Their essence is pure, therefore they manifest purely. We practice their pure aspect when we meditate the mandala. I’m sure you know this roughly, but sometimes it surprises me what people know and what they don’t know. Many people think that after Prince Siddhartha attained enlightenment and became the Buddha, he spoke about mandalas. They think he painted pictures of the deities, carved statues of them, and taught his disciples how the measurements of the surroundings should be, in that way illustrating what they should visualize. You know, that would really be surprising, but that’s how many people think. Lord Buddha definitely didn’t teach in such a way when he transmitted Tantra. Let me give an example. Lord Buddha manifested as Kalachakra, not only as the main deity, but as the entire retinue, when he revealed The Kalachakra Tantra. This is very interesting. When Buddhists, who aren’t students of Vajrayana, see Kalachakra in union with his consort, they are shocked. They don’t understand, but it’s very easy to understand. The male and female aspects of Kalachakra are the same and aren’t two different persons. Lord Buddha manifested as a king and queen when he revealed Kalachakra – he is Kalachakra. The mandala of Kalachakra consists of approximately 900 deities and they are all manifestations of the Buddha. It’s not the case that about 100 students were sitting there, like in class, and Buddha Shakyamuni showed them all the stars and galaxies up in the universe, made sounds down below, and explained time as though it were between the galaxies and sounds. The essence of everything in the Kalachakra mandala, including the essence of time, is beyond time. Time is relative. What is a long time? What is a short time? The Buddha manifested the essence of time as the mandala of Kalachakra, which is known as Düs-kyi-‘khor-lo in Tibetan, ‘The Wheel of Time.’ The entire manifestation of the mandala of Kalachakra is Nirmanakaya Buddha. Mandala is a Sanskrit term. It was translated into Tibetan as dkyil-‘khor. dKyil means ‘center’ and ‘khor means ‘surrounding.’ Nirmanakaya Buddha, Kalachakra, is the essence at the center of the mandala of Kalachakra, and the entirety of existence is the surroundings. So, that is how all Tantras are the manifestation of his teachings. Sound is the teachings. And thoughts manifest as the teachings. How does this happen? How does it dissolve? What happens? The entire manifestation is the teaching as well as the practice. If you paid attention, it would be very easy to understand. When you read a book on Buddhist philosophy, when you read a teaching of the Buddha from Sutra, then you are sitting on your seat “here” and reading The Sutra “over there.” You are trying to understand every word, are trying to remember, and are trying to connect what you understood in your head with your heart, page by page. That’s how it is. When the Buddha taught Sutras, many times the Buddha himself taught. Many times the Buddha went into samadhi (‘deep meditative-concentration’). It happened that by the power of the Buddha's samadhi, a Bodhisattva asked another Bodhisattva questions and that Bodhisattva answered. When the Buddha later awoke from samadhi, he proclaimed these teachings. These teachings became Sutra - blessed and proclaimed. Anyway, that’s how many disciples read Sutras. Some Sutras aren’t like that. Some Sutras are very much like The Heart Sutra, which, from beginning to end, is a practice. But the commentary, consisting of 100.000 verses, i.e., 400.000 sentences, is the longer version of The PrajanaparamitaSutra. Disciples read it from beginning to end, page by page, and understand. The short version of The Prajnaparamita Sutra is The Heart Sutra and is a practice. But, it’s not like that in Tantra. In Tantra, from the page one until the last page, we dissolve into emptiness and we as well as the entire environment around us manifest again out of emptiness, step by step by step. The mantra, the chakras, all these things happen step by step in this way. Then we recite the mantra and have the visualization of that specific recitation. Everything happens in this way, and then, at the end, everything dissolves. What remains is the pure essence of everything. So, that’s the difference between the Buddha’s teachings of Tantra, his teachings of Vinaya (moral behaviour), Sutra (meditative concentration), and Abhidharma (discriminating wisdom-awareness). Always, when it is a Tantra, let’s say The Hevajra Tantra, the Buddha manifests as Hevajra. If Vajravarahi, the Buddha manifests as Vajravarahi. If Chakrasamvara, the Buddha manifests as Chakrasamvara. And each specific manifestation is the teaching. I thought you might know this, but if you don't know, it’s very important to know. Otherwise, while practicing Vajrayana, you don't know exactly what it’s all about. Let me add that there is a very strange habit, especially among East Asians. They call everything “Sutra.” The Buddha taught Vinaya. Then he taught Sutra. Then he taught Abhidharma. Then he taught Tantra. It’s not surprising that East Asians think that a Tibetan monk, who is studying a tantric text, or somebody else, who is reading a history book, is reading Sutra. This isn’t correct. It doesn’t seem to be important, but knowing a lot about Dharma and sophisticated subjects and not being able to differentiate simple things like this means one doesn’t know. It’s embarrassing. It’s like knowing everybody’s name but not knowing one’s own name. It’s so basic to be attentive and to understand. I thought I’d mention this. Today I will speak about something very basic. We are on the ground floor, so the most important thing for us is the basics. We are not on the second, third, or tenth floor; we aren’t there. We are on the ground floor, but you are receiving the empowerments and all of these wonderful teachings from the tenth floor. What you are receiving is very sacred, therefore you should appreciate, cherish, and hold dearly what is being given to you from the tenth floor. But, technically, you are on the ground floor and what goes on there is most important. And while you learn to understand, appreciate and hold in your hearts what takes place on the tenth floor, at the same time, you also have to appreciate and handle situations taking place on the ground floor efficiently. What takes place on the ground floor? First, foremost, and most strongly: the ‘I,’ the ‘me.’ The ‘I’ is the source of all trouble. If you read anybody's biography and if you study the history of any country, you will notice that all problems that arose came and continue coming from the ‘I’ and not from anywhere, anything, or anyone else. Looking at the biographies of Lord Buddha, Jestün Milarepa, Guru Rinpoche, or anybody just as sacred, as holy, as enlightened as they were, we ask, “Why did they become what they became?” Because they overcame the problem of ‘ I.’ They overcame it. We have to deal with our ‘I’ first. What does the ‘I’ do? The ‘I’ is so blind that it can’t see anybody else; it can only see the ‘me’ that is so ignorant. This ignorance takes root. How? When anything or anybody that this 'I' thinks is pleasant for this 'I', it becomes attached to whatever or whoever it is. And when what or who this 'I' thinks is unpleasant for this 'I,' it becomes angry with whatever or whoever that is. That’s how attachment and anger develop from the base, which is the ‘I’ and the ‘me.’ And if there is something or someone that has no relevant effect on this 'I,' it then becomes disinterested or indifferent about whatever or whoever that is. Since time that is without a beginning, every living being without exception has been trying to do whatever they can to take care of this problem, this problem called “I.” Nobody - except those individuals who renounced the ‘I’ – has managed to deal with this problem efficiently. Individuals, who renounce the ‘I,’ decide not to be its slave. Those living beings who serve their 'I' become its slave and continue failing miserably. They are very serious about serving their ‘ I.’ They invest much energy and effort and in the end what they did actually became the most harmful causes and conditions for what they call “I.” This is explained very clearly in many texts. In these texts we read and recite: “All mother sentient beings want happiness, but instead of creating the causes and conditions for their happiness, they are creating the causes and conditions for their suffering. Therefore they are suffering in the ocean of samsara. For that I wish to reach Buddhahood, so that I can liberate them, one by one, and help them reach Buddhahood.” This is The Aspiration Prayer of Bodhicitta. Taking care of this 'I' reliably in order to be able to help all mother sentient beings means not engaging in anything that actually harms the ‘I,’ not remaining enslaved by attachment, anger, jealousy, and our other disrupting emotions and defilements. When our ‘I’ has become free from all that, then we can take the second step and be on the second floor. What do we do on the second floor? On the second floor we transform the ‘I’ by engendering relative Bodhicitta. Thinking, “I wish to reach Buddhahood in order to be able to help all mother sentient beings become liberated from samsara and to reach Buddhahood” is engendering relative Bodhicitta. This takes place on the second floor, not on the third floor. Having relative Bodhicitta means still being dualistic, because it is the 'I' that wishes to reach Buddhahood. Being dualistic means that there is still a goal to reach and beings to help, e.g., ‘my’ friends, strangers, enemies, all sentient beings. We are still strongly dualistic and triplistic. But that is transformed by developing ultimate Bodhicitta, which takes place on the third floor. Again, on the ground floor we thought, “I want to be happy and I want to destroy anybody who gets in my way. I want anybody who gets in my way or disrupts my happiness to suffer.” This is the problem of being on the ground floor. This problem is solved by generating relative Bodhicitta, the wish to reach ultimate liberation to help all sentient beings reach ultimate liberation. We have this aspiration while on the second floor, which means we have transcended the first. Then, when the transformation that took place on the second floor has occurred, the third will gradually happen. We call it “ultimate Bodhicitta.” Relative Bodhicitta will transform into ultimate Bodhicitta when we are on the third floor. Let me say that because I haven’t reached realization of ultimate Bodhicitta, my perception of ultimate Bodhicitta is inadequate. At this time, I’m making use of my perception of relative Bodhicitta to perceive ultimate Bodhicitta. For example, when I look at Mt. Kailash, I don’t see that it is the mandala of Chakrasamvara, which Bodhisattvas on the first level of realization apperceive. I see the perfect geomancy, the perfectly balanced environment, the most beautiful, most inspiring, most harmonious place on Earth when I look at pictures of Mt. Kailash. Unfortunately, I haven’t managed to go to Mt. Kailash physically in this life. But when I look at photographs, I see how beautiful it is, how harmonious it is; that is what I can see. In the same way, what I see as ultimate Bodhicitta might be something like the first stage of a Bodhisattva's realization. A first-level Bodhisattva is not a Buddha and, compared to a second-level Bodhisattva, he has relative Bodhicitta. For a third-level Bodhisattva, a second-level Bodhisattva has relative Bodhicitta. There are ten Bodhisattva levels of realization, and there are more levels in Tantra. Final realization of ultimate Bodhicitta is attainment of a Buddha’s three kayas. So, this way, we must appreciate and understand the highest level and practice it. Of course, at the same time, we shouldn’t neglect the basics, because that is where we are. Our basic level of being is affecting us very, very strongly. We don’t have to admit it, but I know that we are ignorant of so many things and so many times, not only ignorant but also neurotic, unreasonably neurotic. Ignorance is one thing, but I call going beyond ignorance “neurotic.” From time to time we have the problem of being neurotic and then we are very much on the ground floor. But the wonderful thing about being on the ground floor is that we are able to appreciate and understand the tenth floor, the top and highest floor. This is very encouraging. We should never feel discouraged, only encouraged. I thought this is a very basic subject to speak about. The definition of virtue is ‘whatever is beneficial for oneself and others.’ The definition of non-virtue is ‘whatever is harmful for oneself and others.’ But, we can only really know how profound and how precise what we think is beneficial and harmful for ourselves and others are by progressing and maturing more and more. If we do our best and practice, some time we will fully realize what is really beneficial and harmful. But, at this time, what I think is the best for me is actually not the best for everyone. So, through practice, step by step, we will transform and will go deeper and deeper. Our understanding of what is beneficial and harmful for ourself and for others in the short run and long run will become deeper and more and more accurate. Nobody can progress through force. Everybody has to progress by practicing and maturing. In The Rinchen Terdzö - ‘The Precious Treasure Teachings,’ Jamgon Kongtrul Lodrö Thaye presented a short teaching that we should know but somehow and most of the time don’t get. We are like somebody who sees a train pass by and doesn’t know which part of the train is the engine and which wagons are the compartments. We don't know, and the train just passes by. In fact, we don't even know which section of the train we are looking for when we need to board it. In the same way, the teachings pass by and we somehow don't catch on. What is mentioned in this wonderful text is very simple, namely, a disciple of the Dharma should do everything for the benefit of his or her next life, until enlightenment. We don't have to exert ourselves for this life, because in our past life we already set everything up for this life. This life is the result of our past life, so we don't have to invest our thoughts, actions, or energy to make this life better. We should spend all our time and energy, everything, with our next life in mind. We should use this life for the benefit of our next life, until enlightenment. Anybody who puts an effort into working for the benefit of their next life will naturally and automatically benefit in this life. By working for our next life, we don't have to exert extra effort in working for this life. We should be sincere and put an effort into using our body, our speech, and our mind for the benefit of a better life in our next life, in our future, until enlightenment. It isn’t mentioned in the text, but I want to add that all the problems, all the difficulties that we face, and all the suffering we experience are due to focusing so much attention on satisfying our wants and needs of this life. Because we want so much and always want more, we can’t possibly get everything we want. So much suffering comes from wanting so much. If we work for the benefit of our next life, we won’t suffer then. That’s what I wanted to add. Continuing in the text, it is stated that a Dharma practitioner, a Vajrayana practitioner, should put all effort in working for the benefit of the next life. Furthermore, anybody who only tries to work for this life won’t accumulate any benefit for the next life. Therefore, anybody who puts an effort in working for a better next life will automatically benefit in this life. This is exactly what is written here. Forceful deities, usually referred to as “wrathful deities,” were once the total embodiment of evil, and evil is very, very powerful. Evil has masks and wears frightening ornaments. Its environment is just as ferocious and terrifying as it is, and it generates nothing but fear. When evil is transformed into goodness, it manifests as the forceful deities. The forceful manifestations represent the Buddha, who has no limitations. I’m not only referring to Buddha Shakyamuni. When we say “Buddha,” we mean all Buddhas of the past, all Buddhas of the present, and all Buddhas of the future. You might have difficulties relating to a future Buddha. A future Buddha is exactly the same as a present Buddha. Can we identify the present? Is it today? Is it this hour, this minute, this second? Can we catch and hold the present moment? It’s impossible. Just like the present and past, the future is also an illusion. The past and future are only relevant in the present, but the present passes due to emptiness, and the past has passed because of emptiness, too. Therefore the future is also emptiness. So, who is a future Buddha? All of us, all of you, including everything within our body, everything. Every sentient being, without exception, is a future Buddha. When did the forceful manifestations arise? Of course, some of them are described in our mythology, but they are timeless. It happened. It is happening. It will happen, and it is timeless. Knowing this, we know why there are forceful deities. We know what they mean, what they signify, and what their nature is. They are the transformed most tough, most evil, most wrathful, most destructive powers that can be and therefore, when transformed, they appear in a forceful form. Let me give an example. Let’s say you have a big ball that is soaked with ink and you try to wash it with the best and most powerful detergent on the market. And you wash and wash and wash. What do you get when you finished washing it? The ball. That’s what you get. What does this metaphor mean? We are all like the ball that is soaked with ink. We have accumulated karma for countless lifetimes. Because we cling to our devotion and compassion, even they have been and are obstacles for us. We cling to our devotion, we cling to our compassion, and thus we are bound by our devotion and compassion. So, we have to overcome our devotion and compassion by washing and washing. When we have finished, we get the essence and are free of washing, free of anything to wash, free of anything to accumulate or do. Where is the center of space? In order to define the center of space, we have to define its periphery. Space is limitless, therefore we can’t find and can’t define a periphery and center of space. When we can’t find the center of space, then there’s only one answer to the question, namely, the center of space is where we are. If somebody is living in a place in an eastern direction that is billions of universes away from here, that spot is the center of space for him. If somebody is living in a place in a western direction that is countless universes away from here, that spot is the center of space for him. The place I am now is the center of space for me. The place you are now is the center of space for you and therefore it is the center of everything for you. Our mind is like space – it has no limits. But, because of our karma, because of our defilements, our mind is imprisoned in the two-yard body that we have, two personal yards and not two universal yards. For instance, I have to walk from here to there to open the door of this assembly hall, because I can’t do it while sitting here. This brings up the question: What is a miracle? To be able to open the door of this room while staying where I am. It wouldn’t be magic, rather, a miracle. What is the reason it could be possible to open the door from where I am now? Because the mind is limitless. If it functioned fully and weren’t imprisoned, then it could function fully in space, which is limitless. That is the reason first-level Bodhisattvas can perfectly and fully manifest in 100 places at the same time and all the time. I, for my part, can’t even open the door from where I am now; it’s too far away. For a person like me to perfectly manifest in one place for five seconds is very difficult. Actually, one second is very difficult. How is this? I can’t even see where you are looking because I’m not wearing my glasses. I just see your faces, but I don’t see where you are looking. If you open your mouth, I won’t be able to see whether you have teeth or not. I just see the contours of your faces, that’s all. In that way, I’m not perfect, not at all times, and I cannot be in 100 places at the same time. The Buddha is beyond perfect, beyond time, beyond any limitation. That is what Buddha is. The teachings of the view, meditation, action, and fruition can be summarized into three: ground, path, and fruition. We have to know what fruition is first. Fruition is the ground, the ground being the union of the relative and ultimate truths. The path is the accumulation of merit and the accumulation of wisdom in unity. Fruition is achieving the inseparability of the Dharmakaya and the two form kayas. The entire teachings of the Buddha are summarized in these three. As Vajrayana practitioners, we want to reach fruition, which is Buddhahood. What is Buddhahood? We don’t disappear when we become a Buddha, rather, we realize the essence of our mind, which is Dharmakaya, the essence of our speech, which is Sambhogakaya, and the essence of our body, which is Nirmanakaya. For all times, the Sambhogakaya Buddhas and the Nirmanakaya Buddhas manifest and will continue manifesting spontaneously, effortlessly, and free of duality for the benefit of all sentient beings. And that is what we want to achieve. That is our goal. Why do we have this goal? Because it is our potential, and our potential is our destination. Our potential, our destination, is the ground, the indivisibility of the relative and ultimate truths. Relatively, our body consists of inferior material. If we don’t drink at least twice a day, our body cannot function. If we don’t wash once a day, our body will be very bad. If it comes into contact with or is punctured by anything that is sharp and aggressive, it will be injured, maybe even destroyed. So, we have to have accumulated much bad karma, seeing we have to take so much care of our body. And we continue accumulating karma. Drinking a glass of water is karma. Walking is karma. Everything is karma, and that is relative. The same with our speech. As soon as we say something, we somehow destroy the ultimate truth, because the ultimate truth is inexpressible. We destroy the truth that the ultimate truth is ineffable every time we speak, because anything we say is limited. We can’t say anything in the slap of a moment. We have to say everything one by one by one. What about our mind? Our mind is filled with ignorance, with ego, with defilements. Even if we try to be devoted, the strings are always pulled tightly around us. It’s very difficult for us to untie these strings. It’s very difficult for us to overcome our restrictions. That is the relative truth. Ultimately, the essence of our body is Nirmanakaya, the essence of our speech is Sambhogakaya, and the essence of our mind is Dharmakaya. They cannot be contaminated or corrupted. The problem is that everybody can be negative and evil. The good thing is that ultimately no one can be evil – that’s impossible ultimately. So this way, recognizing and realizing the indivisibility of the relative and ultimate truths is the view. Many times people ask me questions about this and find it very difficult, because talking about the relative truth sounds like being in opposition to the ultimate truth and talking about the ultimate truth sounds like being in opposition to the relative truth. People can’t put them together. I tell them that they should never forget that the relative truth is the relative truth of the ultimate truth and the ultimate truth is the ultimate truth of the relative truth. I spoke about space having no periphery, no limit, no end, therefore everywhere is the center of space. If you want to find the center of space, it’s where you are, which is also the end. Seen from the ten directions, that’s the end. Also, seen from the ten directions, that’s the center. So the center and end are identical. That’s how simple and easy it is. Likewise, the relative and ultimate truths are indivisible. It’s so easy to understand. Of course, realizing this is another matter. The next point is the accumulation of merit and the accumulation of wisdom in unity. There are so many levels to it, an endless number of levels. It would take too long to go through all the details now. Let me just give an example. In the preliminary practices, we do the mandala offering, which is an accumulation of merit. We do Guru-Yoga practice and receive empowerments, which is an accumulation of wisdom. This way, the accumulation of merit and the accumulation of wisdom are in unity. If they aren’t in unity, then the same thing happens again, namely, we become dualistic. Accumulating merit still means clinging to a subject, an object, and an action, these three. It’s being dualistic. Accumulating wisdom means becoming non-dualistic. There are many levels to practice in order to realize the highest level of the accumulation of merit and wisdom in unity. It is the same with meditation and action as the path. Practicing and meditating is meditation. Resting or doing something else is action. In meditation, we have to meditate according to our sacred Lineage and the instructions that we received, and we have to do it properly. When we aren’t meditating, we have to be mindful and aware. We have to engage in virtuous activities, be kind, be patient, be compassionate, be devoted – all of that as best as possible. We have to avoid doing anything negative, negative meaning harming ourselves or others. That is the definition of meditation and action in unity. Fruition is the unity of the Dharmakaya and the two form kayas. When people like us enter the Buddhadharma, we first relate to a Nirmanakaya Buddha like Buddha Shakyamuni. We learn his basic teachings. When we have learned the Dharma well, we relate to Bodhicitta. When we have developed Bodhicitta and it has matured in us, then we relate to the deities in the mandala and to the mantras. When we have developed and matured in that way, then we become one with the Dharmakaya. This is how it works in practice: Nirmanakaya, Sambhogakaya, Dharmakaya. But at fruition, when we have realized the Dharmakaya, then we manifest Nirmanakaya and Sambhogakaya for the benefit of all sentient beings. So, this is how the four aspects of view, meditation, action, and fruition are summarized as the ground, the path, and fruition. On this occasion I want to share with everyone that it is very inspiring for me to see so many lay people in our community working very hard by selling sweaters every year, and I really respect this. They could do something much easier and earn lots of money. By working as hard as they do, they digest what they do because of really earning it. People say doing 110.000 prostrations is hard, but what these people are doing is much harder, and they do it every year. As Dharma practitioners, you shouldn’t engage in big-profit-making businesses. Your work may in no way be harmful for others. That is right livelihood. I was asked questions that I thought were very good and I think the answers will be good for you, too. One question was about a student’s fear of death. I told him that there’s no reason to be afraid of death, unless he has done something wrong and knows that he will be in bad shape then. If you haven’t done anything terrible in this life and have done your best, then it will never happen that something is imposed on you when you have died. So, there’s no reason to be afraid of death and you shouldn’t be afraid unnecessarily. We died countless times and shouldn’t be so negative and fearful. Of course, the way we die is another matter. We don’t want to die with lots of pain and many difficulties for ourselves and others. I want to die peacefully, at an old age, only be a little bit sick, not too sick, before I die. Then my mind will be clear and I will pass away naturally. Another question was that if you have good thoughts when you die, your next life will be good, and if you have bad thoughts when you die, your next life will be bad. It’s true, but there’s nothing you can do about it then. You have to prepare now. From now on, you do everything positive, you think positive, have compassion, are good, and live a virtuous life. That will continue and manifest when you die. If you did positive things and were good during life, your death will be positive and good. My non-Tibetan disciples are very friendly, very open, so they ask me questions. I’m not saying that my Tibetan friends aren’t, but non-Tibetans are very open and friendly. They asked that if karma is true, why did so many bad things happen to Tibet? Of course I answer according to the person’s attitude. But I have to get the satisfactory answer for myself. I also want to know - why? After the Dharma was introduced to Tibet, it was very pure for a few hundred years. But then it became part of the culture and heritage. When that happened, the importance of the Lineage, the importance of samaya, all these things were neglected. This didn’t necessarily happen on purpose, but it happened in a kind of evolutionary way. As a result, samaya was broken so often and vows weren’t kept. This is quite apparent from The Rinchen Terdzö. Why did Jamgon Kongtrul Lodrö Thaye travel all over Tibet and work so hard to compile and write The Five Great Treasuries? Jamgon Kongtrul Lodrö Thaye, Jamyang Khyentse Wangpo, and Chogyur Dechen Lingpa worked very hard collecting all sacred Lineages of Buddhism. They travelled throughout the Land of Snows to receive them, and they didn’t have motorcycles. There were no cars and no airplanes at that time, so they had to walk or go on horseback. Tibet is a huge country. The Lineages were scattered throughout the entire big land. Why did Jamgon Kongtrul Rinpoche compile all the initiations, teachings, and own writings that the three of them had received into The Five Great Treasuries? The five are: Shecha Dzö– ‘The Encompassment of All Knowledge’; Kagyü Ngagdzö – ‘The Treasury of Mantra of the Kagyü School’;Dam Ngagdzö – ‘The Treasury of Precious Key Instructions’;Rinchen Terdzö - ‘The Precious Treasure Teachings’; and Gyachen Kadzö - ‘The Treasury of Vast Teachings.’ Why did he do this? He certainly didn’t do all this work because he liked to or because he had to. Rather, he saw that the Dharma was degenerating and therefore disappearing. This clearly shows that he saw, without mistake, that such bad things would happen to us. I think the reason my homeland was so easily invaded and destroyed was the broken samaya and the many negative things that were taking place. The majority of people did not practice the Dharma sincerely and correctly. Of course, there was a minority who did. Many great masters did everything perfectly, and that’s why we still have the Dharma. But all those bad things happened to us as a result of our broken samaya. For example, if you throw a rock and it is flung back at you, you won’t get hit by a flower. So, I think we got the lesson, the very big lesson. I’m telling you this because you are a part of the Lineage. Every master of our Lineage, starting with Buddha Shakyamuni until today, was an ordinary beginner who practiced and became enlightened, became a master. Buddha Shakyamuni was a prince and became Buddha because he practiced. In the same way, each one of us has to seriously practice and take the terrible lesson of what happened to my homeland to heart, doing our best not to allow this to happen again. We contribute to this not happening again by upholding the Lineage, by upholding the samaya, by upholding the vows. If we do that, then I think we have offered good service. We should continue doing our best for the benefit of the next generation, so they can continue and benefit the next generation. Many Tibetan fathers and mothers tell me that their children don’t listen when they speak about the Dharma. I tell them that if they can’t make their children listen to their advice from right now on, then they have failed miserably. I tell parents that they have to hold their children’s hands. They shouldn’t tell their children a hundred times what is right, what is wrong, what is good for them by shouting in their ears and being angry, but by speaking to them with love, care, and respect. If parents do that, then their children might listen to them right now. When they grow up and their parents are dead, they will remember, appreciate, and make good use of what their parents told them. If parents don’t weren’t able to tell their children anything, in the future they will say, “My father and mother didn’t tell me anything, so I don’t know.” I also tell children that they should respect their father and mother and listen to them, because nobody cares for them better than their parents do. It’s natural. Even a wolf, the most cruel animal, cares for its cubs. So, unless a father is crazy and/or a mother is crazy, which is another matter, parents care for their children and protect them, even at the risk of their own lives. I tell children that they should listen to their parents, otherwise they are creating karma. If people treated their own parents badly and when they have children, their karma comes back and their children give them a hard time. So, everybody should respect their parents. Then everyone will have a wonderful life. Children will be wonderful as well. It continues. The Karma of My Homeland: A Lesson? I want to ask you to be very attentive now, because what I said above about culture and heritage can be misunderstood. When I said that the Dharma becomes something like a part of a culture, it can happen after many hundreds of years, thousands of years that it becomes like something I saw, which is only one example. Let me tell you. I am a monk. I’m also an abbot, so I give ordinations. I have ordained about 4000 or 5000 monks in my life, so it’s very important for me to keep my vows. If I don't, then the person will not get them when I give them. That would be terribly bad karma for me, because he would think that he received the vows but actually didn’t. That would be very bad. There are 253 vows to keep. Four are most crucial. Anyone who breaks one of these four is not a monk anymore. And one of the vows is not to lie, not to tell a spiritual lie, not to tell a Dharma lie. And I feel that very little importance is being given to this vow. I have a reason for saying this and want to tell you what happened. A very devoted and important man who is still alive but isn’t here, came to me many years ago and made a request. If he were here, I would be very happy if he heard what I have to say, because maybe then he would wake up. He wouldn’t be offended, because he is very devoted to the Dharma and to the Lineage. He's very sincere and mature, maybe 20 years older than I am. In any case, this man came to me and told me that he knew a very good monk who was very learned, very young, and from a very good family. This man told me that this monk could really serve the Dharma, therefore I should make him a tulku (‘sprul-sku refers to an incarnated Bodhisattva) and give him the title “Rinpoche.” I was shocked to hear him ask this, but, since he was very sincere, I couldn't scold him. He had no harm in mind and had a good motivation. But, what this really told me was that this very devoted and valuable man somehow didn’t see that he was asking me to tell a spiritual lie. If I announce that somebody is a Rinpoche because he is learned, intelligent, a good monk, and comes from a very good family, then that is telling a spiritual lie. Of course, I can make him an abbot, or make him a Lama of a particular monastery, or give him an important duty. That’s different. But saying that somebody is the incarnation of such-and-such a person is telling a spiritual lie. Even though the devoted man who asked this of me was innocent, I realized that people somehow get lost and think the Dharma can be integrated in their culture just for the asking, thus creating bad karma out of ignorance and negligence. The moment this man tried to flatter me by saying that I could declare the monk a Rinpoche because of my Gurus, because of my masters, because of the blessings I have received from them, I clearly knew he was expecting me to tell a spiritual lie. What if I hadn’t seen this? What would have happened if I had listened to him and done this? I would have broken my vows and then the ordination vows that the thousands of monks take from me would not be valid. I’m very grateful for the blessings of all the wonderful masters, of Noble Chenrezig and Manjushri, so that the pure Transmission Lineage is present. Due to their blessings, I can somehow immediately recognize things like the incident I just described. When we go about recognizing a tulku, we make use of all kinds of methods - we pray to the Three Jewels, we pray to the Three Roots, we do divination, we do everything we can. The tulku who has then been recognized can be the son of a criminal, can be born into a poorest family, can be the naughtiest child. Nothing can prevent us from recognizing that someone is the incarnation of a specific person, because everything we did points to this specific person and to no one else. The decision is evident due to the many quite complex things we do. So, when people ask me why such a bad thing happened to the Dharma in our society, then I don't have an answer. I look for the answer, can give an easy answer, but the real answer that would be convincing for me would consist of several points. Seen from another angle, there’s a purpose for this having happened to my land - we can take it as a lesson. If we can take it as a lesson, then we can prevent such a thing from happening again. Then the Lineage of the Buddha and the Dharma will continue, until Lord Maitreya attains enlightenment, which will be in about two million years from now. When the Dharma was brought to Tibet, it remained fresh for several hundred years and many practitioners attained the state of a Mahasiddha, a ‘great enlightened master.’ So many wonderful things happened in Tibet. After several hundred years, things slowed down. The same thing happens on a personal level. When one somehow gets something, it becomes something like a status quo, a position within mainstream, and thus it stagnates - it comes less and less from the heart. Knowing that it’s crucial to keep the Dharma fresh is important for all Buddhists. Newer followers of the Buddhadharma add a fresh quality. I’m not talking about just becoming a Buddhist and following a pure living Lineage. I think that those of you who are beginning to follow the living Lineage are a very good balance for us. The Dharma is fresh and genuine for you, while we are born into it. This way you remind us and we can learn from our past mistakes. For instance, if a few persons hadn’t asked me the question about the karma of my homeland, then this thought might never have occurred to me. And if this thought hadn’t occurred to me, then maybe we would let everything just keep on going the same way it has. So, thank you very much. In The Rinchen Terdzö, Jamgon Kongtrul Lodrö Thaye offered very profound instructions on the four immeasurables and gave easy examples for them. The four immeasurables are very important. We are able to practice Bodhicitta because of them, so all practices of a Bodhisattva are the four immeasurables, tshäd-med-bzhi. In the prayer, we pray to have immeasurable loving kindness, immeasurable compassion, immeasurable joy, and immeasurable impartiality. But in practice, the sequence is: compassion, loving kindness, and joy, impartiality being the base for the three, which means it has to be practiced at the beginning. Loving kindness is byams-pa in Tibetan, maitri in Sanskrit; compassion is snying-rje in Tibetan and karuna in Sanskrit; joy is dga’-ba and mudita; impartiality is btang-snyoms and upeksa. When impartiality is the base of our practice, it makes our compassion immeasurable. Having immeasurable compassion means having compassion for all suffering sentient beings and wishing that they be free of suffering and free of the causes and conditions of suffering. For example, I’m Tibetan, but this wish doesn’t imply that I wish that only all Tibetans or only all human beings living on Earth be free of suffering, rather, immeasurable compassion means wishing that all sentient beings in the entirety of space be free of suffering and free of the causes and conditions of suffering. The example given in the text is a mother without arms watching her child being carried away by the strong current of a river. How can she rescue her child? She will scream for help and do something. Jamgon Kongtrul Rinpoche gave this as the example of what immeasurable compassion is like. When impartiality is the base of our practice, it makes our joy immeasurable. The example Jamgon Kongtrul Rinpoche presented is that if the child that was carried away by the strong current of the river is saved by someone and is brought to its helpless mother, what would she feel? Immeasurable joy. When impartiality is the base of our practice, it makes loving kindness immeasurable, like a doctor is to his patients. Almost in every initiation ritual of the Medicine Buddha, and there are many, the samaya of a doctor is clearly taught. He should see any blood, puss, etc. that comes out of his patients as nectar, not dirt. Furthermore, a doctor should respect and care for his patients just like a father and mother care for their child. Jamgon Kongtrul Rinpoche presented many other examples, but this is the basic samaya of a doctor. So, loving kindness should be like keeping a doctor’s commitment. Following, impartiality is compared to a very good king who shares everything in his treasury with everyone. There are several historical accounts about yogis offering special prayers they received in their mind from the Buddhas and Bodhisattvas to everybody in the vast expanse of space. Jamgon Kongtrul Rinpoche tells us that our impartiality should be like that. These examples are really easy to understand, therefore I thought I’d share them with you. Every living being has basic compassion, basic loving kindness, basic joy, and basic impartiality. It’s funny that almost every Tibetan is very afraid of snakes. It’s interesting that they think that snakes are full of anger. I find this strange, because I like snakes. I used to have a pet snake, but couldn’t keep it because everyone was so afraid of it. After my friends and relatives had fled, I felt lonely and there was nobody around except my snake. Thinking snakes are bad makes things worse. Even snakes have basic compassion and basic loving kindness and they feel basic joy and basic impartiality towards their young ones. When a snake has a litter of five, it feeds and protects all of them equally. I personally think hyenas are the most aggressive and cruel animals, but they have basic compassion, loving kindness, joy, and impartiality for their cubs. I think that you know what “immeasurable” means. The Tibetan term is tshäd-med and is also translated as ‘limitless, measureless, countless.’ Only Bodhisattvas have limitless compassion, limitless loving kindness, limitless joy, and limitless impartiality, until they reach Buddhahood. They are very joyful about any progress. Joy is the opposite of jealousy. I think jealousy is the worst defilement. People who are jealous suffer when they see or learn that somebody else is happy and they are happy when they see or learn that somebody else or others suffer. That’s jealousy, and being jealous means being very evil. Joy means being happy about anyone’s happiness, which means their happiness is our happiness. Impartiality has many levels. The profoundest level of being impartial is being non-dualistic. Prayers are being recited here everyday and I appreciate very much that you are doing this. I know that you are reciting prayers so that my activities flourish and spread and for my long life. But I want to ask you to please pray for the long life of His Holiness the Gyalwa Karmapa, Ogyen Trinley Dorje, and for the long life of all the great masters of our Kagyü Lineage. There are so many Kagyü Lineages, but generally there are twelve. The Marpa Kagyü is one of the Eight Lineages of Vajrayana Buddhism. I want to ask you to pray for the long life and good health of all the Heads of all Great Buddhist Lineages as well as for the community of the Sangha, all the monks and nuns, all the lay followers, practitioners, yogis, for everyone. I also want to ask you to pray for all human beings on Earth, for all sentient beings everywhere, for enlightenment – that is my request. And thereby may every enemy (mental defilement) be overcome. That is troubled by waves of birth, old age, sickness, and death. Lead every being without exception to that very state! And may precious Bodhicitta that has already been never decline, but continuously increase! May the Glorious Lamas and Khenpos live long. May peace and happiness fully arise for beings as countless in number as space is vast in extent. May all living beings without exception swiftly establish the levels and grounds of Buddhahood. May your life be long and your activities be extensive. Karmapa, you appear as the form kayas’ magical illusions. And your infinite, spontaneous activity blaze in glory. Photo of H.E. 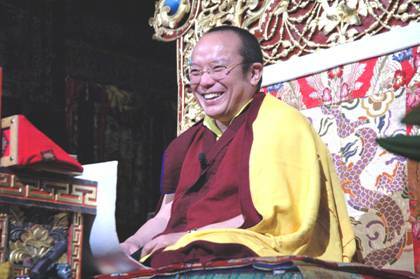 Tai Situ Rinpoche in 2008 provided by Mahamudra.org in Malaysia. The original transcript of the teachings presented here was typed at the Palpung Sherab Ling Monastic Seat and sent to the editor of this article in 2007 by Zhyisil Chökyi Ghatsäl Charitable Trust, Auckland, New Zealand, with the request to edit the books entitled “Nectar of Dharma” by Khentin Tai Situpa. This article of teachings presented on September 24, 26, 29, and October 1, 2, 4, 5, 8, 10, 15, 2006 was edited and arranged for the Dharma Download Project of Khenpo Karma Namgyal at Karma Lekshey Ling Monastery in Nepal by Gaby Hollmann, responsible for all mistakes. Photo of mural of “The Seven Examined Men” in the Samye Monastery, Tibet, taken in 1986 by Gaby Hollmann. 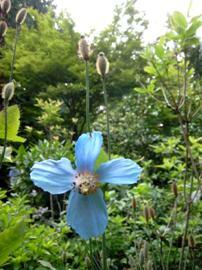 Photo of the blue Himalayan flower taken at Buchart Garden on Victoria Island, BC, by Lena Fong of San Francisco and offered on November 7th for this article. All persons and organizations mentioned here have copyright for their contribution . This article is made available for personal use only and may not be reproduced or published. Munich, 2009.